Agent Double O Cash is one of the best in the business. Click here to play! While he may be a bit indiscreet, using a famous country rock star alias as his cover, he gets the job done and writes some great songs to boot. The public may not know it, but he single-handedly won us the Cold War by destroying the Mecha-Lenin Death Robot that rampaged through Moscow in the early 1990s. You are to learn everything you can from Double O Cash, from his espionage skills to his performance skills. Right now, we have him on a special meeting in San Quentin prison. He hates that place right good, but I've never known him to turn down a mission to save America. I digress. You will learn from Double O Cash by assisting him in taking out a special terrorist cell know as the Ring of Fire. They are holding a special slots tournament to launder money from their illegal arms dealing, and intel says that you're the best slots player in the service. Double O Cash will distract the terrorist cell, and this will free you to find out more about their operations. You will know agent Double O Cash by the fact that he's always dressed in black, so contact him and then start playing the slots. One last thing: as an added bonus, you can keep whatever you win on the slots during this mission. You'll have to come out of it alive, though, so good luck in your duties and good luck on the slots, agent. The Watch symbol is a scatter symbol that pays out on the total bet and also awards free spins. 10 to 30 free spins are awarded when 3, 4, or 5 scatter symbols land on adjacent reels, and this feature cannot be retriggered during the free spins. 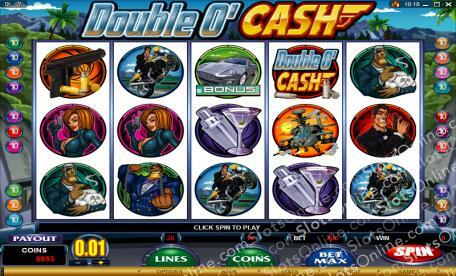 The bonus game is triggered when 3 or more Sports Car Bonus symbols land scattered on adjacent reels. In this bonus, the player chooses 3 of 15 landmines that each explode and award a bonus prize.